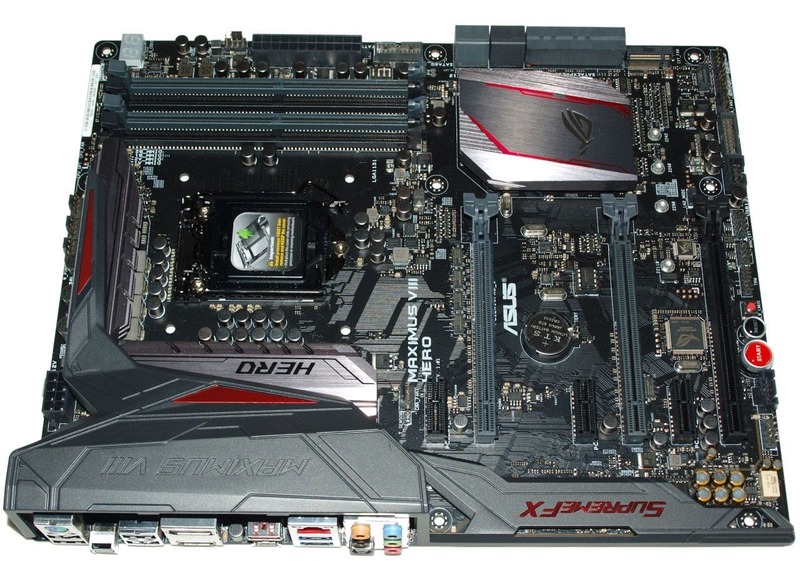 Home » Reviews & Articles » Hardware » Desktop PCs » Asus Maximus VIII Hero, Z170, Skylakes Hero! Asus Maximus VIII Hero, Z170, Skylakes Hero! The Asus Z107 Hero VIII was the initial launch board we received to review the Intel Core i7 6700 and we would like to thank our partners at Asus for the Hero VIII and their support during the Skylake 6700K Launch. Without their guidance and timely updates Skylake might have been SkyPuddle but they came through like gangbusters. 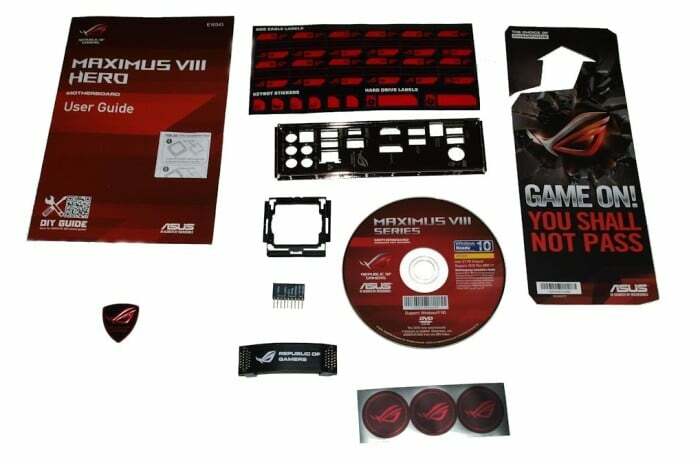 The Asus Hero VIII is one of the first ROG boards ready for SkyLake and considering the timeframe Asus had to work with they put out an impressive board. 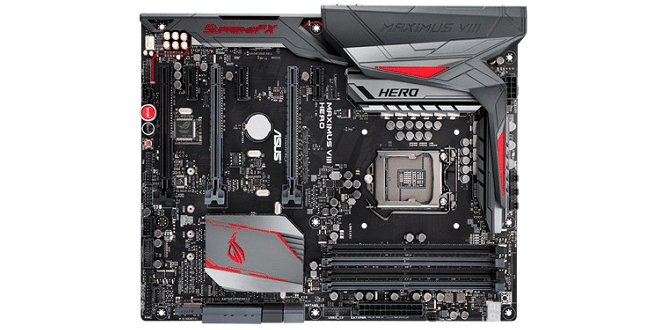 Most noticeably the Asus Maximus Hero VIII doesn’t support the same color scheme we’ve seen on other Maximus ROG boards. 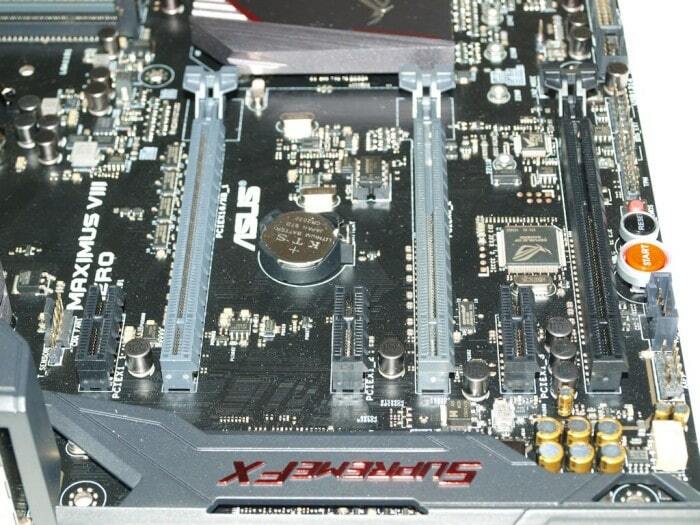 It has a few hints of Red a little chrome flash and compared to previous generations of Maximus boards is rather muted. The Hero VIII will support a pair of Video cards, supports USB 3.1. an M.2 drive and is feature rich enough that we can tell Asus is aiming the Hero at mid-level to enthusiast end users. the board can be found for 235$ from Amazon at the time of writing. 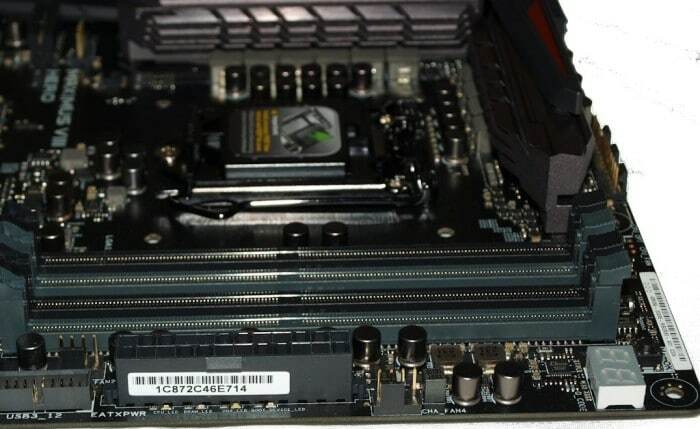 Most notably on Z107 and the Asus Z107 Hero VIII the first 16 PCI-E lanes are embedded in the CPU itself and are the Grey PCI-E 3.0 slots pictured above. Here’s the Specifications straight from the Asus Webby. 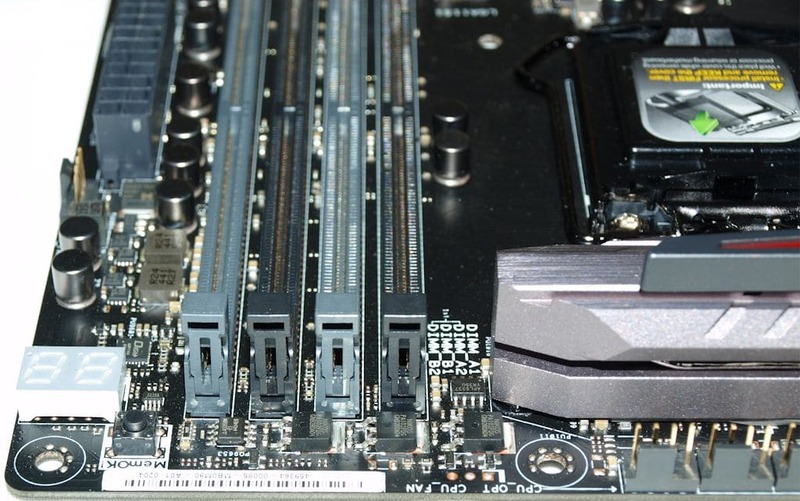 What we are reading is that the two gray slots are a combined pool of 16 PCI-E 3.0 lanes that can run with one GPU at x16 or two GPU’s at 8x 8x, those stem from the CPU itself. 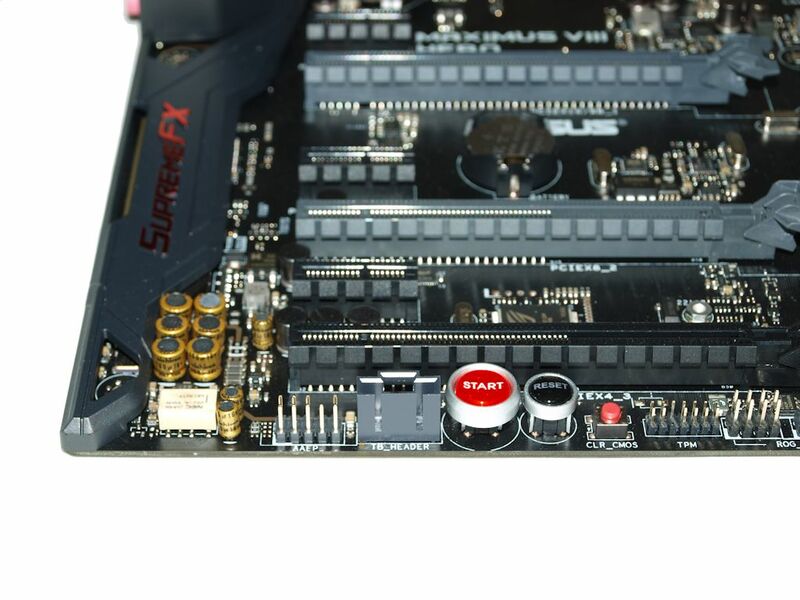 Then we have 1 PCI-E 3.0 slot x16 in size but runs at x4 mode, that’s your black slot extreme let of the photo, then there’s 3x PCI-E 3.0 running at 1x. Of course Z107 is the mainstream platform but one GPU at 16x or two at 8x seems a little stingy to us. That is of course a decision made by Intel and Asus designed the architecture around that but you can bet we’ll be seeing boards with more PCI-E 3.0 slots provided by add-on chips. What that means for the Hero VIII is limited for SLI or Xfire and two top end cards might bottleneck on the 8x 8x it has to play with. 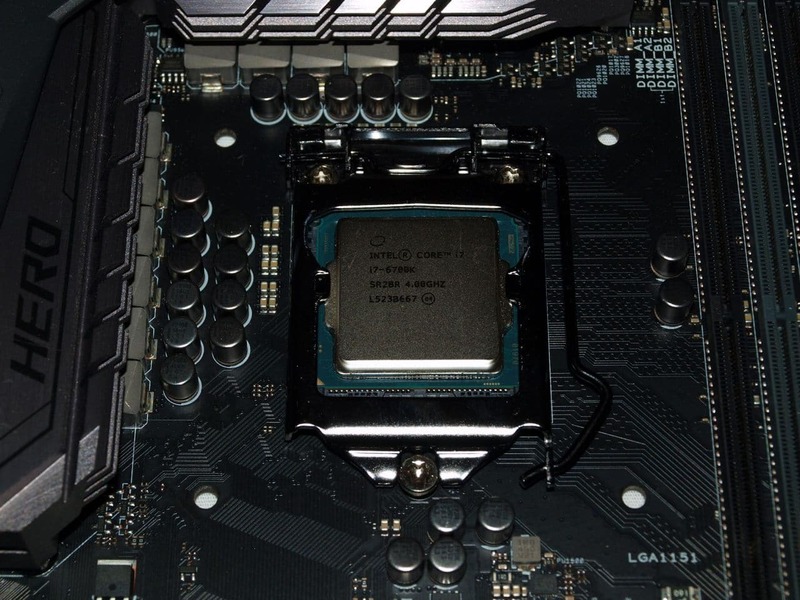 Shown with the yet elusive 6700K installed the Asus Hero VIII features 8 phase CPU power, Microfine alloy chokes and 16k long life solid capacitors. We won’t cast a spoiler yet but anyone thinking 8 phase power isn’t enough just go ahead and do a head slap now. The 8 phase power is plenty for the 92W TDP i7 6700K which is actually 3W less than it’s predecessor the i7 4790K. Skylake is a Dual Channel Ram creature and the boards we’ve seen so far present 4 ram slots and the maximum ram on Skylake is 64GB so if you are planning on the future you need to invest in 32GB Ram kits. The ram itself gets 2 phase power with We’re looking at the front 24 pin Power connector edge of the board and you can see the double-digit debugger and Main power connector and to the left of that you get a peek at the USB 3 connector. Sliding farther left by the last PCI-E 3.0 expansion slot you see the TPM connector the CLR CMOS button, reset and start buttons. ThunderBolt Header and the audio header as well as the Start, Reset and Clr Cmos buttons. It seemed like the X99 chipset always had the Al1150 Audio and it’s good to see that there is going to be a variety of audio on Z170. We’ve already seen the Asus SpremeFX 2015 and a setup by SoundBlaster so that’s a good indication of a wider variety of audio on Z170. 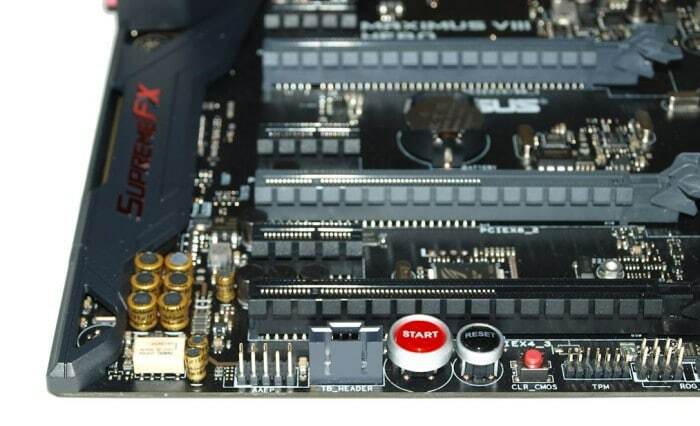 Starting on the left you have the Mouse / Keyboard PS2 so popular among extreme overclockers that run a stripped down OS to achieve higher speeds, Below that is two USB 2.0 ports (the lower port is the USB FlashBack), then to the left the USB BIOS Flashback button, then two more USB 2.0 ports. THe Z107 chipset and the HD 530 IGP support up to 3 monitors but the Hero provides a HDMI and a Display Port which is plenty for the IGP as it’s not for high-end gaming. To the left of the Video you have the two USB ports a Type-C and one Type-A. Moving left an Intel Ethernet port and below that two USB 3.0 and farthest right the gold-plated Audio Jack and the Optical sound port. The z170 chipset provides 6 Sata ports and Asus adds two more using an ASMedia controller, four ports are invested in Sata Express and 4 ports Sata 6G then to the left of the ports you can see the M.2 SSd connector and thankfully on the Hero VIII it’s not situated right up under the PCI-E ports. 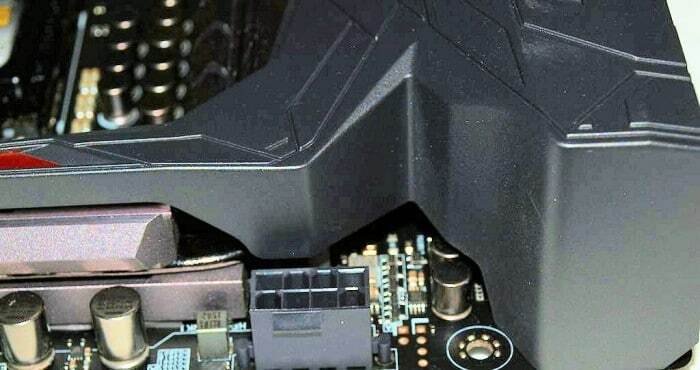 The SupremeFX sports Fine Gold Nichicon capacitors and is driven by a RealteK Codec hidden away under an EMI shield peeking out from under the plastic cowling. The whole setup utilizes an anti-popping relay that prevents audio popping during startup. Here’s a better look at the 4x M.2 slot that is capable of handling all current sizes of M.2 drives. Starting from the capacitor on the left we have a USB slot, a USB 3.0 connector, a 4 pin PWN fan header and the front panel connector. 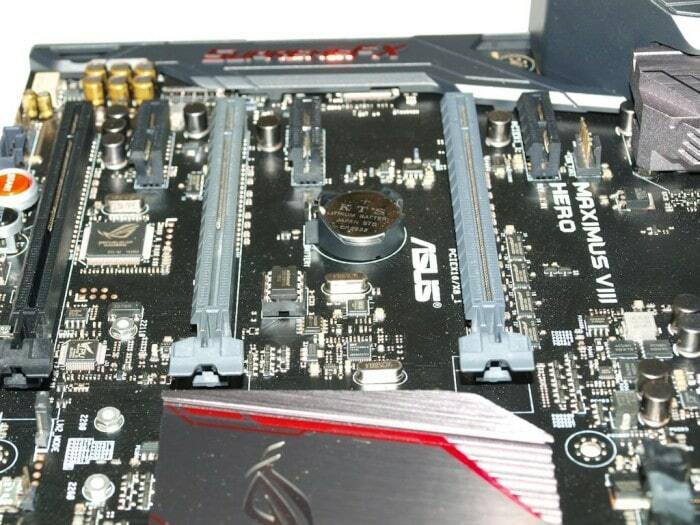 Asus includes a front panel block but color coding of the case connector would be a nice feature. The CPU Power Connector is squirreled away behind the plastic housing up by the VRM heatsink so you might want to think about connecting the CPU power connector before bolting the board down. Just left of the CPU power connector you find 3 4 pin PWM connectors, a decent look at the 4 ram banks and the solder points where you can use a multimeter to check voltages. That takes us all the way around the board and back to the Post Code block we like to call the Double Digit Debugger. 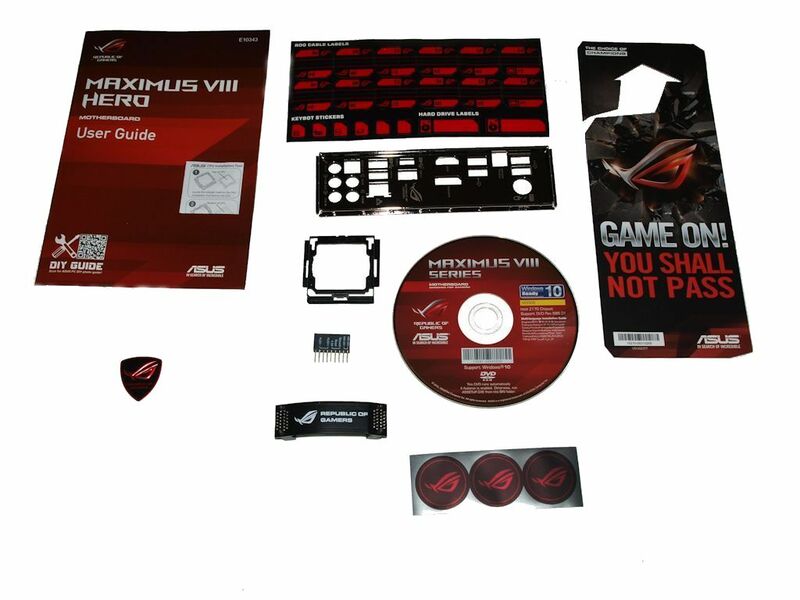 The Asus Maximus VIII Hero bundle looks a little fleshed out but it’s a pretty basic bundle with some stickers for fans, cable stickers, case badge and a few little nice extras. The entire list of accessories is listed below. 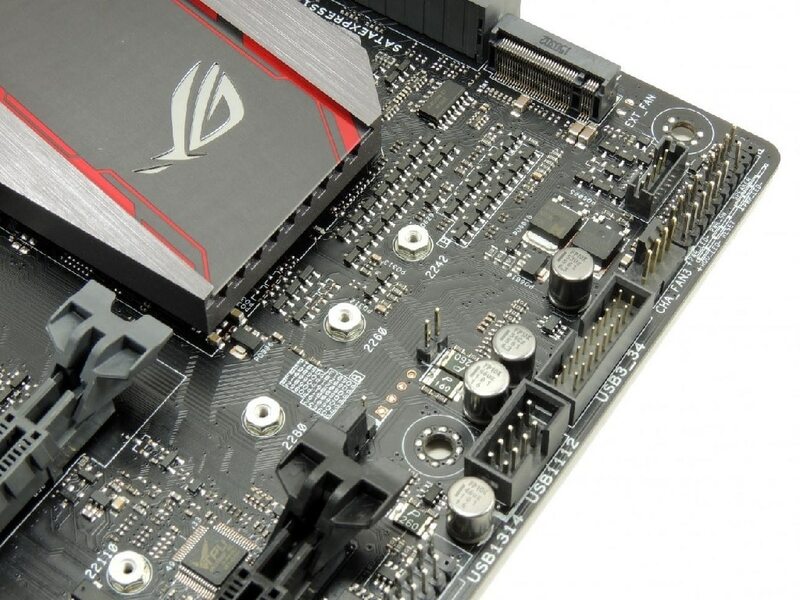 The Asus Maximus Hero provides all the gaming and overclocking comfort you will ever need on the Z170 platform. Performance and OCing were high but we found the number of USB ports on the I/O plate lacking.